The last two days were filled with amazing experiences. Yesterday, our first visit was to Peace Cycle. A beautiful woman of God, Rose, welcomed us to her facility. We were introduced to her employees to whom she is teaching job skills; turning used plastic materials into a variety of resellable goods. The employees are so happy and thankful for their jobs. We visited another orphanage where we read the bible story of the one lost sheep and made a craft. We continued to play with the children. They were happy singing songs and making wonderful artistic sidewalk chalk pictures. We made a planned stop at Papillion. This business was started by to help the orphanage crisis here in Haiti. She started with very few employees and now has over 25 people working for her. One woman was homeless with her children and recently was able to buy a house for her family! She is strengthening families through job creation. At the restaurant, they had furniture that was made out of pallets. We ate pizzas and drank smoothies. Today, we went to a 6 AM church service at Church On The Rock. We joined with our Haitian brothers and sisters in Christ, in praising and worshipping our great God. Jesus is alive everywhere, even with the language barrier. We did another water truck run in Cite Soleil where we filled hundreds of buckets of water and aided in delivering them to their homes. This provided us with another opportunity to hold and love on the children. Immediately after delivering the water, we went to the Hope school and served lunch to the children who are so adorable. They were excited to see us again. In the afternoon, we went shopping to pick up some snacks and ice cream seemed to be the favorite snack to buy in this hot, humid weather. Our last stop today was at another orphanage. We were welcomed by the children singing to us. They had a 2-year-old boy as the choir leader (We have pictures to prove it.) We played with the children, hugged them, held them and laughed and sang with them. On this particular visit, Healing Haiti provided 23 brand new mattresses. The children will be sleeping in new beds, bought in Haiti, from Haitians, for Haitians, this is why local sourcing is so important. 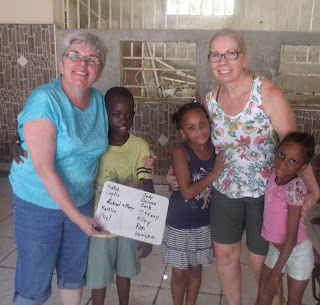 This was a huge blessing for this orphanage. 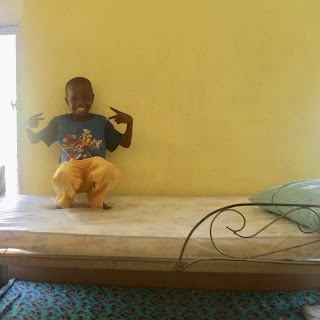 The children were overjoyed and helped us put sheets on the beds. Our visit ended with singing and waving goodbye. God is stretching and challenging us as we continue to serve Him.